L: 38" x W: 37" x H: 34"
Meyer Chenille Chair Give your living room a stylish and streamlined look with this classy Meyer chenille chair in granite. It features soft chenille fabric, attractive flared arms and solid maple feet that provide the perfect finishing touch. Its durable, high-quality sinuous coil spring system and Dacron®-wrapped foam cushion provide the comfort you need for hours of relaxation. A beautiful accent pillow completes the chair's striking look. Give your living room a stylish and streamlined look with this classy Meyer chenille chair in granite. It features soft chenille fabric, attractive flared arms and solid maple feet that provide the perfect finishing touch. Its durable, high-quality sinuous coil spring system and Dacron®-wrapped foam cushion provide the comfort you need for hours of relaxation. A beautiful accent pillow completes the chair's striking look. This is a great chair for a small room. It is comfortable and elegant. Love it! 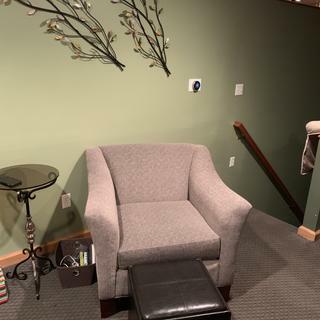 This chair is the best place to relax after a day at work.|It is so comfortable. |I recommend it with the matching ottoman. |Anyone who has the space should consider the entire set. I looked at this chair when the one i had liked online was not available in the store. I am very happy with the look and feel of this chair. Super comfy and very stylish! Loved this new addition. The color matched the decor perfectly. Thanks for the time and recommendation. This chair is very comfortable and spacious. The fabric is good quality plus it was made in America. This is a great chair. The sophisticated looks adds to any rooms decor and the chair is very good quality. I love it and am very happy with this purchase. I don't usually write reviews but this chair from R and F is so comfortable, I just had to tell you all. The Fabric matches almost any color scheme and the "fit" of ones' body in this chair is great. I just recently received it and can't wait to spend more time hanging out in it and relaxing. Great sofa, comfy, durable and great looking. The chair and sofa make a great combo. Nice, firm, comfortable chair. I also bought the matching loveseat. Good color, matches well with just about anything. A bit pricey, though. Chair is very comfortable and we are very happy. I bough this chair online without ever seeing it in person. When it got here, I instantly fell in love with this char! It is the perfect size for my space, the color is beautiful, and it is super comfortable. This chair is going into my reading nook, and I can't wait to spend a Saturday morning reading a good book and drinking coffee in this char! The Chenille chair that I recently purchased for my living room is very comfortable and fits in very nicely with my existing furniture. very nice set of chairs and sofa. using it for church sitting area. great price too. only thing that surprised me was how high off the ground it is. I'm 5'6", average height, and my feet don't touch the floor when I sit against the back! Not a problem, just surprised at how much higher they are than the chairs we were replacing! My husband likes this chair very much. It is an attractive, sturdy piece of furniture. The chair is ok, its comfortable to sit in. When looking at the chair in the store I thought it was just a tad bit bigger but other wise it's a comfortable chair. Can I order just the pillow shown with the granite chair? BEST ANSWER: Hi phillygirl478, thank you for your interest in the accent pillow that is shown with the Meyer Chenille Chair. Yes, this accent pillow can be ordered through your local showroom. BEST ANSWER: Yes, it is made is Taylorsville, NC. Is the color like a tan or beige color or tweed like tan? What color are the chair legs, are they dark brown? Are the feet removable for shipping/in-store pickup? BEST ANSWER: The feet on the Meyer collection are not removable.